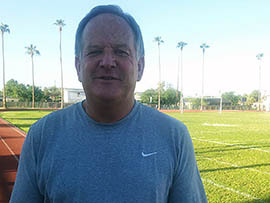 PHOENIX – Bernie Busken, who led Mesa Mountain View High School to three state championships, is used to practices that get straight to drills and plays. But this 6 a.m. practice at North High School in central Phoenix starts with instruction on where to line up on the sidelines and the importance of showing up for practice and school on time. “It’s all about having discipline,” he tells his players. “It’s these little things like knowing where to sit on a bench that make a difference in a game,” he adds. A state championship isn’t quite as realistic a goal at North, which won just two games last season. The Division I team lost its first game of this season to No. 2-ranked Phoenix Mountain Pointe 64-0. But Busken said he decided to come here after a knee surgery had him contemplating retirement because of the impact he can have on the students. 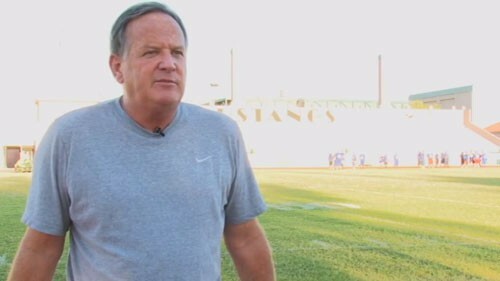 He turned down offers to become an athletic director in Oklahoma and an assistant coach at a college in California. Asked why, he responded with a laugh. “Well, the last few days, I’ve wondered why,” he said. “I’ve been so blessed to work with great players and have great programs, and I just think it’s OK to come back and help,” he said. It wasn’t the program that called Busken to this inner-city field but the athletes. Besides winning games, one of Busken’s major focuses is teaching life lessons. He said he’s already seeing a change in the players and his expectations for them to be responsible. “One kid told me he’d never been on time to school until this year,” he said. Sophomore Tommy Moreno, a junior varsity quarterback, said Busken has instilled expectations that are helping the team. “Since we’re more disciplined, we’ll be able to get the count down and stuff like that and remember our plays because last year people slacked off,” he said. Busken’s strategy for this season is keeping it simple as he rebuilds the program to fit his coaching style. While Busken said he doesn’t expect to be taking home a championship this year, he does have confidence that his team will grow. New football coach, Bernie Bunsken, is already influencing the lives of players on and off the field. Elle Johns with Cronkite News shows us how Bunsken is giving new hope to the school. Bernie Bunsken, who led Mesa Mountain View High School to three state championships, said he decided to become football coach at North High School because of the influence he can have on students.